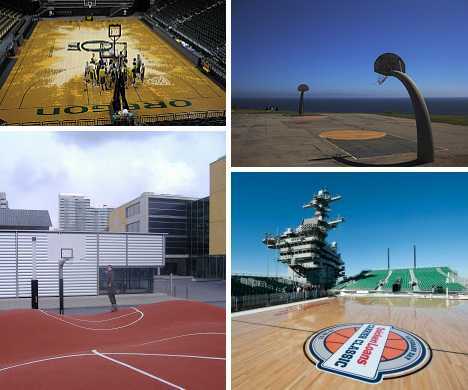 These 12 jaw-dropping basketball courts stretch the limits of Dr. James Naismith’s original vision far beyond the prescient gym teacher’s wildest hoop dreams. We’re not sure if the Occupational School Center Munich in Germany even has a basketball team but if they don’t, they should, since their decidedly out of the ordinary three-dimensional court takes the concept of home field advantage to absurd levels. 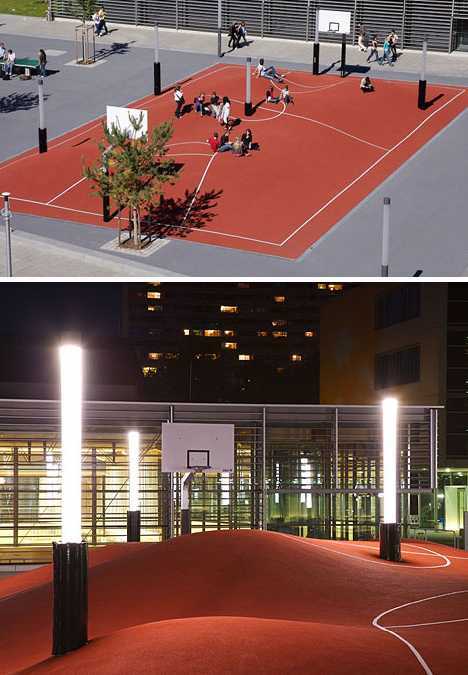 Titled 3D² by artist Inges Idee and created in 2006, the regulation-sized basketball court incorporates several of the existing lamp posts that – besides providing light – add an extra dimension of difficulty to any attempted game. According to Idee, playing on the computer-designed court “requires creative engagement for its use.” No kidding. 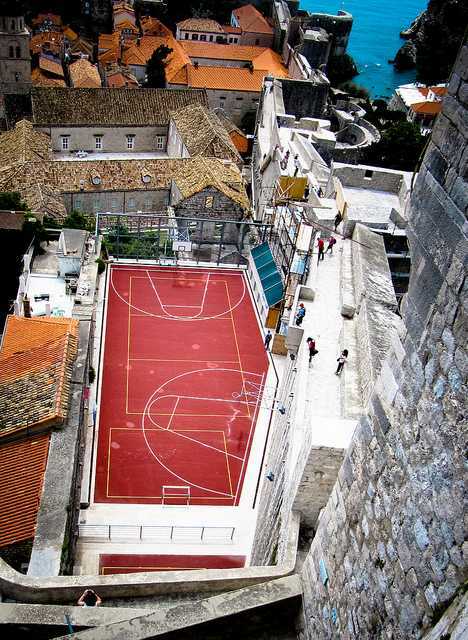 Space is at a premium in the ancient seaside city of Dubrovnik but so is the desire to go one-on-one with one’s fellow dribblers. Captured magnificently by Flickr user SloTraveller, this otherwise unremarkable clay court shoehorned between centuries-old buildings is a favorite photographic subject aided by some spectacular points of view. 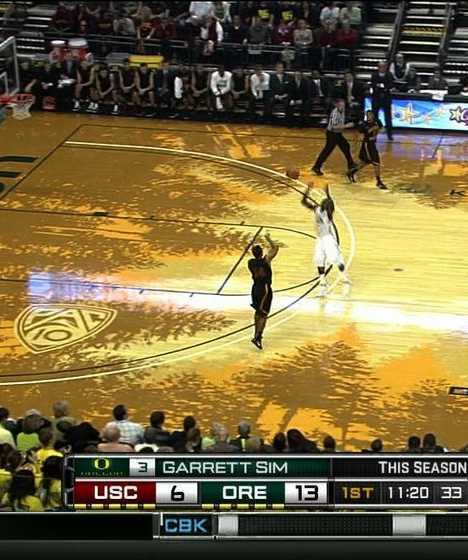 “Riding the pine” took on a new and better meaning for members of the University of Oregon Ducks when, in 2011, their strikingly stenciled new basketball court was unveiled to the public. 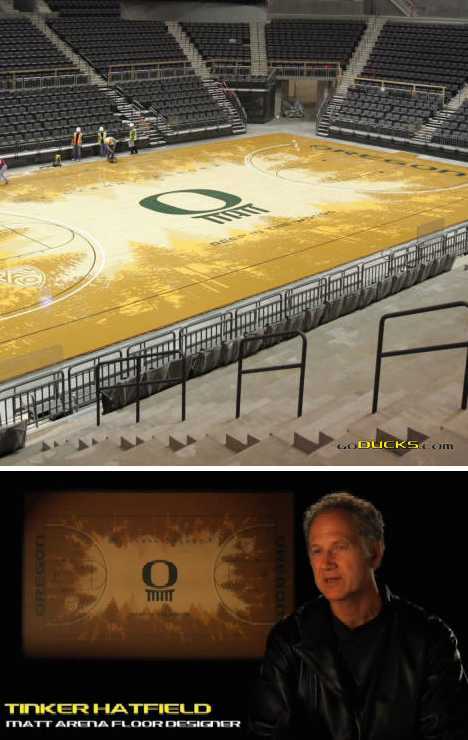 “We wanted to design the most iconic television presence possible for the University of Oregon,” explained Nike’s vice president for design and special projects Tinker Hatfield, “by conjuring up a highly unique and visible basketball floor design” at Matthew Knight Arena. We’d say they succeeded. Intended to reflect the view of someone looking skyward from a Pacific Northwest forest floor, the court is made from 6,944 square feet of sustainably-harvested Northern Hard Maple weighing approximately 45,000 total pounds. The graphics were completed by Idaho Falls, Idaho -based United Services using almost 2 miles of stencil material and requiring 2,500 man hours of labor.